Eighty-five years ago St. Cloud hosted one of the biggest barbecues the world had ever seen. Between 40,000 and 70,000 people converged on the site of the Pan Motor Company, a company that promised to make St. Cloud the next manufacturing powerhouse of the Midwest. Within two years the plan foundered in a swamp of conspiracy theories and alleged fraud, ending a colorful but obscure episode of Minnesota history. And Pan Motors has left behind a precious few of its luxury automobiles, an elegant reminder of St. Cloud's shot at the big-time. This Pan Model A is owned by private collector Roy Bernick, and is one of three running Pan Cars in St. Cloud. A fourth is currenty being refurbished. View a slideshow of old and new images of the cars, historical news-clippings, and pictures from the barbecue. On July 4, 1917, Sam Pandolfo, the passionate promoter behind the Pan Motor Company, threw a party. But his huge barbecue was also one of the most unusual initial public stock offerings the country had ever seen. Lee Richter of St. Cloud had an uncle who was drawn by Pandolfo's free food. "If they come to a free lunch, they might buy something maybe, if they have something to sell," Richter said. "And (Pandolfo) had stuff to sell. He was selling the Pan motor company." That year 10 prototypes of the so-called "Pan Car" were assembled by hand in Indianapolis and driven to the barbecue in north St. Cloud. One-hundred-twenty of Pandolfo's men worked the crowd, talking up the cars and hawking $10 stock certificates. Certificates sold that day and over the next few months netted $10 million for the company. Many first-time investors staked their life savings on the Pan, and the mood was nothing but upbeat. At the picnic site, construction had begun on the automobile factory, which would ultimately cover 47 acres where a Frigidaire freezer plant stands today. Pandolfo thought St. Cloud had all the qualities of a great manufacturing hub, and the barbecue was designed to win the hearts and financial backing of the community. One of the first Pan Cars captivates the crowd at the 1917 barbecue. He brought in a trainload of live Texas steers, 15,000 lbs. in all, along with a small army of southwestern barbecue cooks. The cows were slaughtered in St. Paul and the meat was sent on to St. Cloud, where it roasted on spits over long trenches. According to news clippings, the event claimed 8,000 loaves of bread and cleaned out every pickle for miles. But it wasn't quite the grand success Pandolfo might have hoped. In fact, Richter says his uncle's memory was that the barbecue was something of a fiasco. "He always said that the meat didn't get done, and the wind just blew so bad everything was covered with dust," Richter said. "So it just wasn't very good." The imported army of barbecue cooks, it turned out, may have been magicians with mesquite but were unprepared for the slower-burning oak they found in Minnesota. They cooked the sides of beef for 24 hours as they normally would have done. But thousands of people lined up and found that their meat, which looked so good on the outside, was nearly raw below the surface. "Mr. Pandolfo had made good the judgment of those who had faith in his wonderful organizing ability and the consumation of this great undertaking." The local newspapers barely mentioned the raw beef incident, and continued their role as enthusiastic boosters. According to a news story in the following day's St. Cloud Daily Journal, "There is no question but that the barbecue was the greatest single advertisement for the city of St. Cloud in its history and the Pan Motor Company gained a prestige that will be hard for it to lose." "Everybody wanted him to succeed," said Bob Lommel, a Stearns History Museum archivist whose father knew Sam Pandolfo. "It's the same thing as Fingerhut today. There are a lot of jobs at stake. Imagine somebody comes into an area, and he's not even a native here. As you know, he was a southerner. He decided to build the plant where he did because he thought St. Cloud was going to be the crossroads of the world." Pandolfo's personal writings provide the narrative for a short film the museum made about the company's fortunes. "St. Cloud was ideal," the voice-over says, "smack in the center of America's bread basket. It was close to the Iron Range. Two main rail lines were already handy. The farmers and people of the area were natural mechanics, who could be trained for factory work." 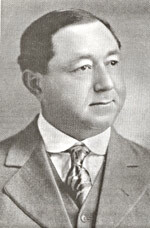 Pandolfo first found success selling life insurance in the southwest. He claimed to have been the first traveling salesman to drive from call to call, and said he wore out 37 different cars in the process. His inspiration for the Pan Car came from the constant break-downs and discomforts he experienced. He designed a sturdy touring car with all the contemporary bells and whistles. The dashboard had such innovations as a gas gauge, a built-in clock, and best of all an electric starter, which meant no more cranking. The canvas roof retracted easily and the front and back seats each folded down to turn the interior into a bed. In back it had a trunk and even a built-in icebox. Today the Pan Car in the best shape may belong to the St. Cloud Antique Auto Club, also known as "The Pantowners." It's one of only seven they know of in the world. Every now and then member Harry Grimley gets a turn to drive it out in public. 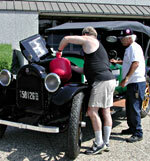 Harry Grimley drives one of two Pan Model A's owned by the Antique Auto Club, also known as "The Pantowners." This car is normally on display at the Stearns History Museum. "(People) stop dead in their tracks and want to look it over, and they want to know what it's all about," Grimley said from behind the wheel. "For some people maybe it's the first time they've every seen a car like this." Perhaps distracted by the microphone, he grinds the gears in the three-speed transmission and laughs it off. "Very tricky on the gears." To prove their road-worthiness, Pandolfo sent three cars over rugged terrain to Colorado in 1918, where they climbed Pike's Peak. To show just how tough they were, one of the cars was driven by Tony Wood, a man from Brainerd who weighed in at 480 pounds. The company eventually made about 750 Pan cars in St. Cloud, and the plant garnered valuable government contracts for other goods during World War I. Early on Pandolfo also built six square blocks of distinctive houses for his workers, most of which still stand today in a section of St. Cloud known as "Pantown." Pandolfo brought running water and sewer lines out to Pantown and to his plant, and he gets credit for developing what had been a barren part of the city. Pandolfo takes a test-drive in one of the first Pan Cars. But from this point the story gets ugly, and the facts are in dispute. Pandolfo had the law on his heels from the start. In 1918, the Minnesota Securities Commission ordered him to stop selling stock. Officials charged that Pandolfo was a swindler, who pocketed half of every stock certificate. Those charges were dropped, but in 1919 a Chicago grand jury charged Pandolfo and his 12-man board with mail fraud for making false claims about the company. Among the charges: A so-called "plane's eye view" of the factory portrayed on the company's flier was not actually drawn from inside a plane. Archivist Bob Lommel believes the Pan Motor Company was the real thing. "Pandolfo was quite a visionary," Lommel said. "Most of our local people don't think of him as a crook, they think of him as a victim of a vast conspiracy of the eastern automobile manufacturers." Pandolfo himself also claimed the businessmen of Minneapolis had conspired to undermine his company and keep St. Cloud from developing a competitive economy. But that, said Lommel, "is a conspiracy theory to which I do not subscribe." Auto Club members Harry Grimley, left, and Kirk Dickinson gas-up the club's Pan for a drive. Pan Cars got between 14 and 20 miles per gallon. Conspiracy or not, the effect was devastating. His board got off the hook but Pandolfo served 3 years in Leavenworth Federal Prison. During the legal wrangling, confidence in Pan Motors dried up. Life savings were lost. One version of events says St. Cloud residents, burned by this business-deal-gone-bad, assumed an anti-business attitude that lasted for years. But they never took it personally. Pandolfo got a hero's welcome in St. Cloud upon his release from prison. And some folks say maybe it's not so bad the Pan Motor Company is relegated to local folklore and a few spectacular old cars. Lee Richter, whose uncle sat down to raw, dusty beef at the world's biggest barbecue 85 years ago, says "Just think, right now we could be sitting here in another Detroit. "Maybe," he says, "it is better this way."